If ever there were a leather hat to handle the job, the strapless Raging Bull would be it. 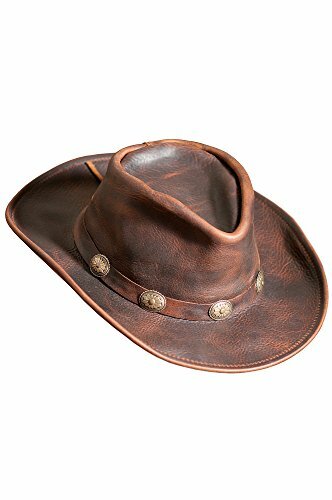 Made of rich, full-grain leather, this rugged hat is wonderfully durable, featuring a smooth hand, thick body, and superb protection from the elements. A tied hatband adorned with five conchos adds western appeal, while a cushioned sweatband keeps you cool and comfy in the heat of the moment. Shapeable 3" brim. Made in the USA.